We returned to Foley’s Town House in Killarney after Ladies’ View and settled in before dinner. 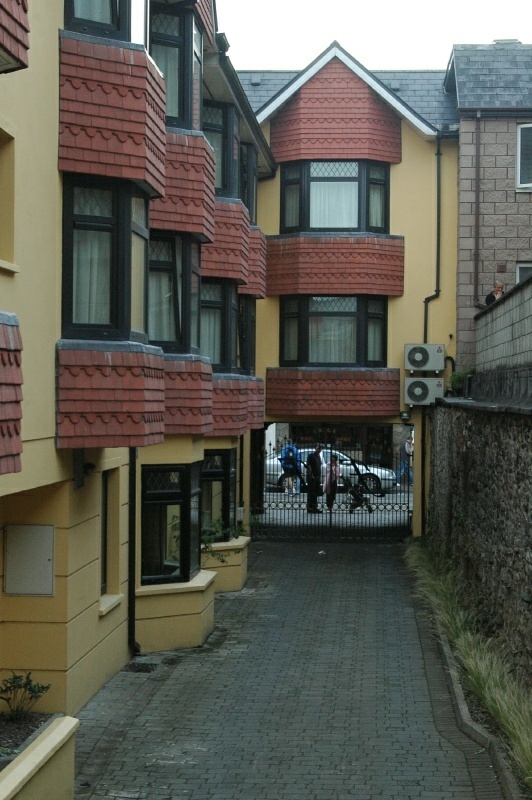 This view is from the hotel’s rear, from the car park toward the security gates on the street. Dinner was good – but, embarrassingly, there was yet another group of mortifying, loud Americans in the dining room, a group of about eight 30’s-ish guys who were not only a bit loaded, but also occasionally obscene. Not bad enough to be kicked out, but still embarrassing. We were chagrined throughout this trip that the only obnoxious groups we encountered, among many, many nationalities, were from our own country.